When it comes to Six Sigma methods and tools, the 5S method has been one of the most successful. This is due to its simplicity in describing the steps a process in the workplace should be comprised of to make it optimal. 5S originated in Japan and has proven to be one of the most invaluable Six Sigma methods the world over since it does an efficient job at reducing wastage in a process. In Japan, the five Ss in 5S are seiri, seiton, seiso, seiketsu, and shitsuk. 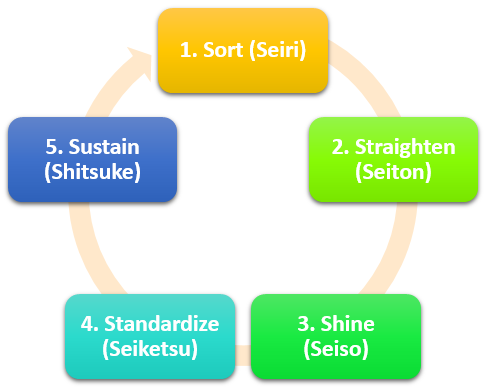 In English, they translate to sort, straighten, shine, standardize and sustain. These steps are sequential and incremental steps. This means they all need to be done in order since each step builds upon the last. If a step is missed or out of sequences the resulting process will miss its improvement window. The diagram below shows what the five Ss of 5S are and the order in which they should be performed. Before we talk about 5S in more detail, there is an extra S that is worth mentioning: Safety. Before undertaking any project or event, safety requirements need to be established. Furthermore, they need to be evaluated at every stage of the project or event to ensure everything is going smoothly and no one is in danger. Once a process has been identified that could use 5S performance improvement, the following steps need to be conducted to make the event successful. It all starts with making an inventory of all items and then sorting them out into two categories: necessary and unnecessary. This includes all equipment and materials. Those items that go into the list of unnecessary things need to be discarded, leaving only those that have been deemed necessary. Before being categorized, the items need to be red-tagged. After that, their fate is discussed with the appropriate stakeholders who then decide whether to keep or discard them. With only the essential items remaining, the next step involves putting them where they belong. The items must be arranged in a way that retrieving and storing them is easy and convenient. This means that whenever anyone wants a tool or piece of equipment, they must immediately know where to go to get it and where to put it back, reducing travel wastage. Doing things this way also makes it immediately known when an item is missing. When the workplace is dirty and disorganized, it can be hard to identify problems. That is what this step is all about – making sure the work environment, whether it is an office or construction site, is clean. Everything that remained during the sorting phase is thoroughly cleaned. In this step, there will be a lot of sweeping, vacuuming, mopping, painting, labeling and other cleaning activities. But the emphasis should be placed on uncovering and eliminating the actual root causes of the uncleanliness and getting rid of them. This step is about creating standards that will ensure the cleanliness of the workplace. People are assigned roles and responsibilities of what they must do to maintain the standards. All work areas are made consistent or identical so that it is easier for workers from other areas to come in and perform the process. And with the standards in place, everyone knows what is a normal or abnormal situation, and can alert management for further action. The final step ensures that the previous steps are not a once-off event when deemed a success. Here, the steps for an ongoing audit of the 5S event are outlined, leading to the constant maintenance and refreshment of the improved workplace. It is also important to let everyone know that sticking to the 5S method is their job. As you can see, 5S is a method that embodies the heart of what Six Sigma represents; reducing waste in a process. It can be used in any organization for any process, whether it is in an office or manufacturing plant. And once the areas of 5S performance have been identified, continuous improvement makes sure optimization is always moving with forward momentum. The post The 5S Method of Six Sigma appeared first on Shmula.